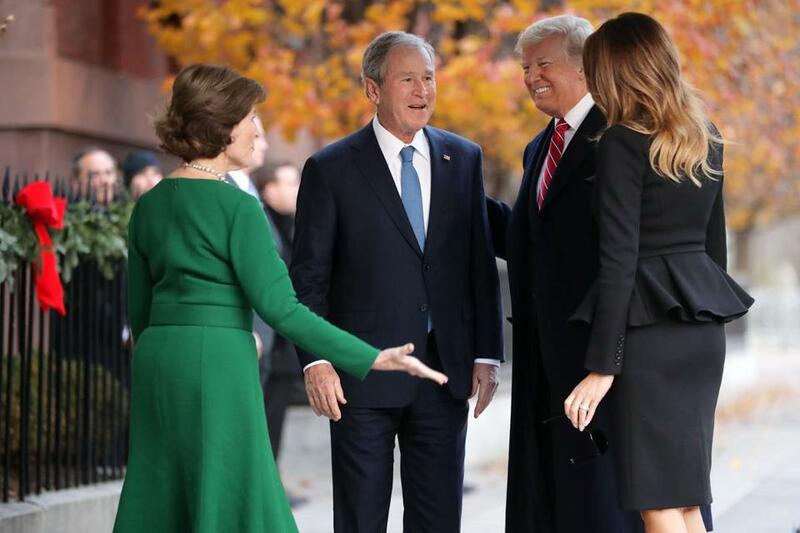 Former first lady Laura Bush and former president George W. Bush greeted President Trump and first lady Melania Trump outside of Blair House on Tuesday. WASHINGTON — President Trump traversed a wide political chasm Tuesday when he welcomed George W. Bush, his occasional foil, to Blair House, the guest quarters across from the White House. But the actual distance was just 250 yards — a route Trump and his wife, Melania, traveled in the presidential parade limousine, with a motorcade of at least seven other vehicles. The Trumps spent 23 minutes visiting with Bush and his wife, Laura, by all accounts a cordial meeting. It was the latest in a series of magnanimous gestures President Trump has made this week to honor the legacy of former president George H.W. Bush, whose state funeral is at the National Cathedral on Wednesday. The motorcade, however, prompted questions about why the Trumps were unable — or unwilling — to simply walk across the street. ‘‘Presidents, including the last one, have made the walk before,’’ said Ned Price, National Security Council spokesman in the Obama administration. He noted President Obama walked Chinese President Xi Jinping to Blair House after a private dinner in 2015. Trump’s motorcade traveled along West Executive Drive, between the White House and the Eisenhower Executive Office Building. The gates on Pennsylvania Avenue swung open, and the presidential limo turned left, stopping a few yards later in front of Blair House. As is the custom when foreign leaders or other dignitaries are at Blair House, Pennsylvania Avenue and Lafayette Park had been cleared of pedestrians, who usually congregate in front of the White House for pictures or protests. White House aides declined to say why the Trumps chose to take a motorcade. Obama often employed a full motorcade for short trips, including fund-raisers at nearby hotels; those trips entailed closing in downtown Washington, sometimes during rush hour, thereby snarling evening commutes. WASHINGTON — Spinning off from the special counsel’s Russia probe, prosecutors are ramping up their investigation of foreign lobbying by two Washington firms that did work for former Trump campaign chairman Paul Manafort, said people familiar with the matter. The investigation had been quiet for months, since special counsel Robert Mueller referred it to authorities in Manhattan, because it fell outside of his mandate of determining whether the Trump campaign coordinated with Russia. But Justice Department prosecutors in the past several weeks have begun interviewing witnesses and contacting lawyers to schedule additional questioning related to Podesta Group and Mercury Public Affairs, the people said. They spoke to The Associated Press on condition of anonymity because they were not authorized to discuss the ongoing work. The New York work underscores the broad effects of Mueller’s investigation, extending beyond the central question of President Trump and collusion. Mueller has made it clear he will not turn away if he discovers crimes outside the scope of his inquiry; instead, he refers them out in investigations that may linger on even after the special counsel’s work ends. Other referrals from Mueller have ended in guilty pleas, including the hush money payment case of Trump’s former lawyer Michael Cohen.